IN THE WAKE of Donald Trump’s triumphant march to the White House, I wanted some memorabilia of the historic event — to remember that I was a player. 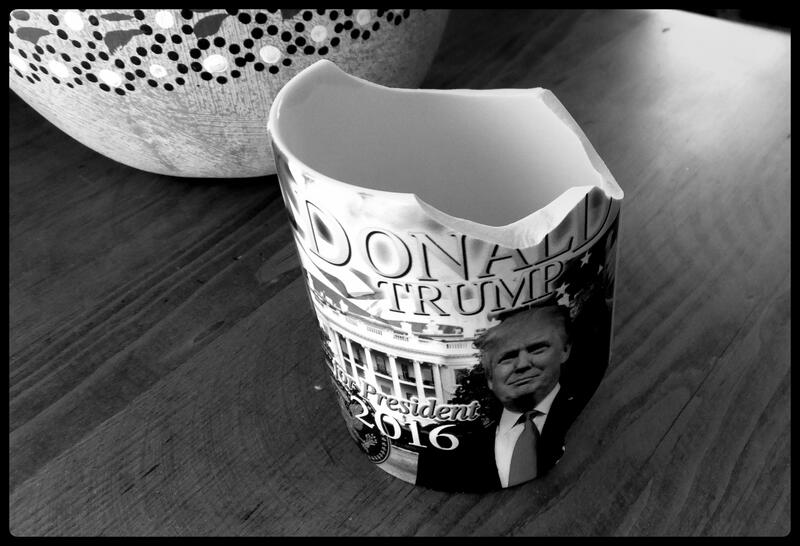 I went to eBay and bought a commemorative cup for 17 bucks, and had it shipped to Mexico for an additional 10. I intended to set the cup on my desk to hold pens and pencils. And I’d have Trump’s proud face before me while sitting here. The cup was surrounded with bubble wrap and boxed for its trip south. When I picked it up downtown here at the Estafeta office, it made an unsettling clinking sound. When I opened the box and unwrapped the cup from its protective insulation, it was well-smashed. There is no explanation aside from this: When the box was opened at the border at Mexican Customs, which is the custom, the agent broke it, probably with a hammer. Then he rewrapped it and put it back into the box. Don’t that beat all? Tsk, tsk, tsk. And then there is karma. Gordie/Clete: Yep, or something like that. Smokesilver: Possibly but possibly not. I am not speechless but smiling. I was given 3 large Trump campaign signs which I placed in my flower gardens in my back yard and when asked, why there? I stated, so I can watch the USA bloom and grow again. But until the day the new President is sworn in I had not thought of looking for a memorabilia item, but now you have inspired that purchase. Pat: eBay is full of it, so go for it. Since your package will not be passing over the desk of a Mexican Customs agent, I imagine you’ll receive whatever you purchase in good condition. I would order another, but the chance of the same thing happening again would be very high. Pat: Go to eBay, and type Trump memorabilia in the search bar. I just did. It’s amazing what you’ll find there. And another sore loser makes a statement about being pi$$ed! Carole: How right you are! And not for the first time. Well, actually, the Customs agent, not being an American, lost nothing. The Donald had just pi$$ed (as you say) him off. It’s understandable. The coverage of the election campaign here in Mexico focused on one issue alone, the wall. Mexicans have no clue about the broader elements of why Trump won: PC nonsense; unisex public restrooms; demonizing of Christians, Jews and Israel; women in the Marine Corps infantry; choose-your-own gender; coddling of Mohammedans; “white privilege;” the Apology Tour; ObamaCare lies and scam; Beyoncé half-time shows; Black Lives Matter; Social Justic Warrior violence, etc. For them, it’s the wall thing 100%. And, of course, Mexicans believe it’s their God-given right to sneak into the U.S. whenever it suits them. Can’t really blame them. The U.S. government, of both parties, has turned a blind eye for decades to the invasion over the southern border. I am sure you will be able to find some Donald stuff at one of the flea markets around, if not now but soon. Funny story, because many years ago, that was a quirky way to get back at a relative or mother-in-law that you didn’t like. For Christmas you would go and purchase a inexpensive set of wine glasses or something similar, wrap them up and, after carefully placing them in the box, take a hammer to most of them. Then present it to them and, hopefully, be around when they unwrap their presents at the Christmas tree. Now it’s pretty hard to get away with that since now the packing materials are better than just wrapping the stuff in old newsprint. Tancho: We won’t be finding Trump memorabilia at flea markets here in Mexico. Count on that. As for your get-back method of giving Yule broken presents to certain people, why, that is just mean. I never heard of it. I’ve had two live mothers-in-law. They were okay people. Karlos: I seriously doubt that. That the nation is currently on a downward spiral, and has been for years, is clear to many — but hardly all — people. The Donald represents a very sharp turn. Exactly how it will turn out is yet to be seen. I, however, am optimistic. There is only one way, and that is up. Feel free to see it otherwise.